IS THE TRUTH THAT GOD ALONE IS. FOR THE FATHER GOES BEFORE ME. (36) My holiness envelops everything I see. From my holiness does the perception of the real world come. Having forgiven, I no longer see myself as guilty. I can accept the innocence that is the truth about me. Seen through understanding eyes, the holiness of the world is all I see, for I can picture only the thoughts I hold about myself. (37) My holiness blesses the world. The perception of my holiness does not bless me alone. Everyone and everything I see in its light shares in the joy it brings to me. There is nothing that is apart from this joy, because there is nothing that does not share my holiness. As I recognize my holiness, so does the holiness of the world shine forth for everyone to see. (38) There is nothing my holiness cannot do. My holiness is unlimited in its power to heal, because it is unlimited in its power to save. What is there to be saved from except illusions? And what are all illusions except false ideas about myself? My holiness undoes them all by asserting the truth about me. In the presence of my holiness, which I share with God Himself, all idols vanish. (39) My holiness is my salvation. Since my holiness saves me from all guilt, recognizing my holiness is recognizing my salvation. It is also recognizing the salvation of the world. Once I have accepted my holiness, nothing can make me afraid. And because I am unafraid, everyone must share in my understanding, which is the gift of God to me and to the world. (40) I am blessed as a Son of God. Herein lies my claim to all good and only good. I am blessed as a Son of God. All good things are mine, because God intended them for me. I cannot suffer any loss or deprivation or pain because of Who I am. My Father supports me, protects me, and directs me in all things. His care for me is infinite, and is with me forever. I am eternally blessed as His Son. Remember the beautiful ever, and look for the agreements rather than for disagreements. Do not condemn that which has not been applied nor that self has not experienced in the same character of circumstance. Thus, never repeat that which might be harmful to anyone, even though it be only gossip for the moment. (Sanskrit: आदि शङ्करः Ādi Śaṅkara, pronounced [aːd̪i ɕaŋkəɾə]) (788 CE - 820 CE), also known as Śaṅkara Bhagavatpādācārya and Ādi Śaṅkarācārya was an Indian guru from Kalady of present day Kerala who consolidated the doctrine of advaita vedānta. His teachings are based on the unity of the ātman and brahman— non-dual brahman, in which brahman is viewed as nirguna brahman, brahman without attributes. Shankara travelled across India and other parts of South Asia to propagate his philosophy through discourses and debates with other thinkers. He is reputed to have founded four mathas ("monasteries"), which helped in the historical development, revival and spread of Advaita Vedanta. Adi Shankara is believed to be the organizer of the Dashanami monastic order and the founder of the Shanmata tradition of worship. 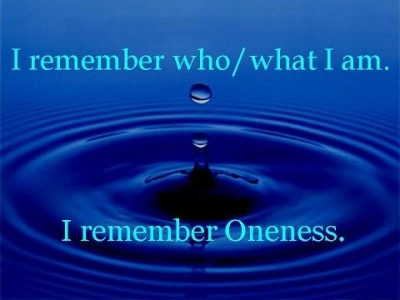 Repeat "All is One" to yourself throughout the day.